The National Spring Clean is now called Clean Up Scotland Campaign. It’s clear from the efforts made in 2012 that many, many people are fed up with the impacts that not only litter; but dog fouling, graffiti, flytipping, flyposting and abandoned vehicles, have on local communities. For the past six years Keep Scotland Beautiful has encouraged volunteers, like you, to organise and carry out litter clean ups. Now, building on the momentum from the success of National Spring Clean, we, and the Scottish Government, want to raise the profile of these illegal activities and gradually adjust the attitudes which cause these problems. We launched a new year-round mass-engagement campaign – Clean Up Scotland – at the tail end of last year. Encouraging year round participation, and working towards preventing litter at source, this campaign aims to quickly remove the litter and mess which blight landscapes and causes social, health and economic damage to the country. We have the support of government and business in Scotland. However, we can’t do this without your help and so would be delighted if you’d help us scale up National Spring Clean by participating in our new Clean Up Scotland campaign this year and beyond. 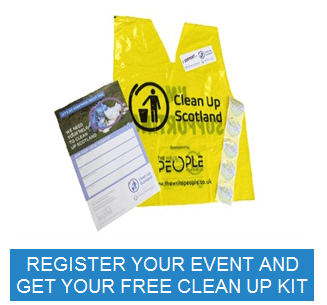 • Take part in a clean up or organise your own with family, friends, neighbours or colleagues. Clean ups will be an important part of the campaign and if you would like to organise or take part in an event this spring, or at any other time of the year, you can order a free kit, containing new tabards, stickers for children, an A3 poster and a supporter window sticker, from us at www.cleanupscotland.com/get-involved/clean-up-kit – please allow at least two weeks for delivery. **For any clean ups registered for April and May, you will be eligible to apply for free treats from Greggs again (once registered you will receive an email telling you how to do this – again, you need to allow at least two weeks for this to be processed). Further information about Clean Up Scotland can be found at www.cleanupscotland.com. Thank you again for your kind and valuable support, we look forward to working with you to make Scotland shine! Still time for a Spring Clean! Do you have a space to plant free trees?